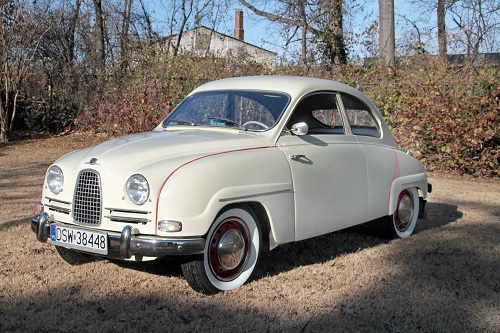 Saab’s Model 93, introduced Dec. 1, 1955, was only the company’s second automotive model, and was the first to be exported in significant numbers – most came to the US. The 93 was designed by famed Swedish industrial designer Sixten Sason. Sason was best known for his designs for Saab, (Saab 92, 93, 95, 96, 99, and Sonett, plus many aircraft), but he is also credited with the designs for Electrolux vacuum cleaners, Hasselblad cameras, and Husqvarna motorcycles of the period. 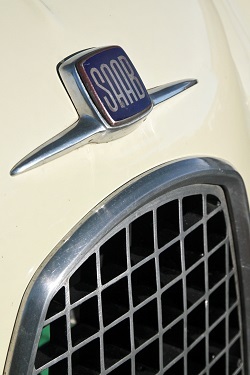 The hood badge, a simple logo atop stylized wings, was an homage to Saab’s aircraft roots. 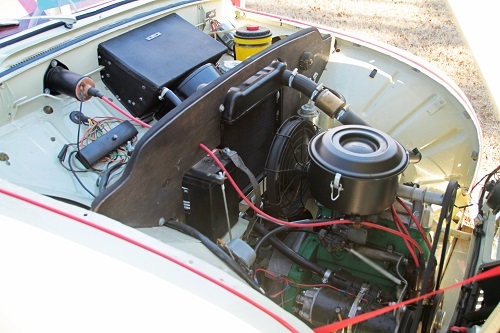 The 93 series engine was Saab’s response to competitor DKW’s upcoming three-cylinder, two-stroke engine under development in the mid-1950s. The 92’s 2-cylinder, 850cc 2-stroke gave way to the smaller, but more powerful and smoother, 3-cylinder in the 93. Other significant changes from the 92 included the use of coil springs instead of torsion bars, and a 12V electrical system. 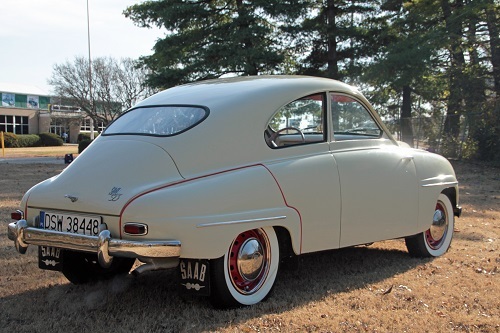 Early Saab 93s (the “A” model) had a two-piece windshield, while the B, introduced Sept. 2, 1957, utilized a one-piece windshield, and was the first automobile to offer two-point safety belts as standard equipment. 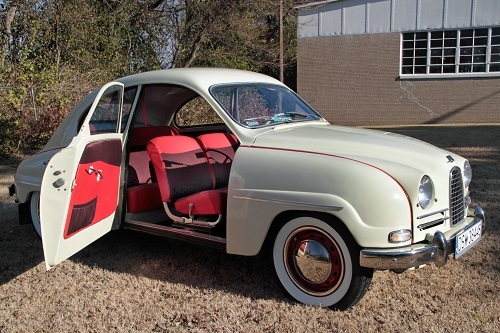 The “F” came along in 1959, with conventional front-hinged doors the most visible change. Saab’s relatively powerful, front-wheel drive coupe was seen by many, including rally great Erik Carlsson (aka Mr. Saab), as a potentially outstanding race and rally car, and it was. Carlsson won both the Swedish and Finnish rallies in a 93, while other drivers took 93s to class podiums at the Mille Miglia and 24 Hours of LeMans. 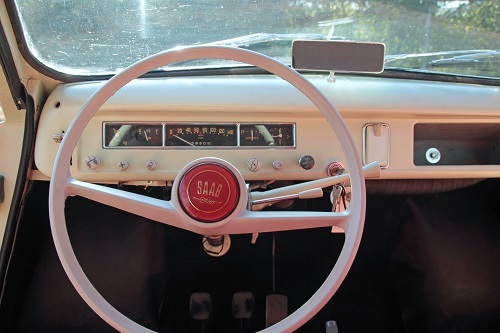 Road & Track’s May 1957 review credited the 93’s overall win at the Great American Mountain Rally that year with establishing Saab’s beachhead in the US, equating the victory to a million dollars’ worth of advertising.